Getting around. Bruges can be easily discovered on foot; all attractions in the center are located closely to eachother. Alternatively you can use the practical network of city buses (the small ones) that circulate in and around the center. Tourist office. There are several tourist information offices in the town. One at the station of Bruges, one in the Concert building (Zand square) and one on the Market Square. Tours. Bruges probably has Belgium's most extensive offer of tourist facilities. Tours can be arranged at various places in the center. 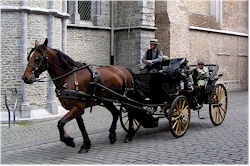 Several options are available: tours by boat, minibus, horse carriage,... It is also possible to rent a bicycle and ride around; Bruges has limited traffic by car in the center so it is quite a safe place to drive a bike.